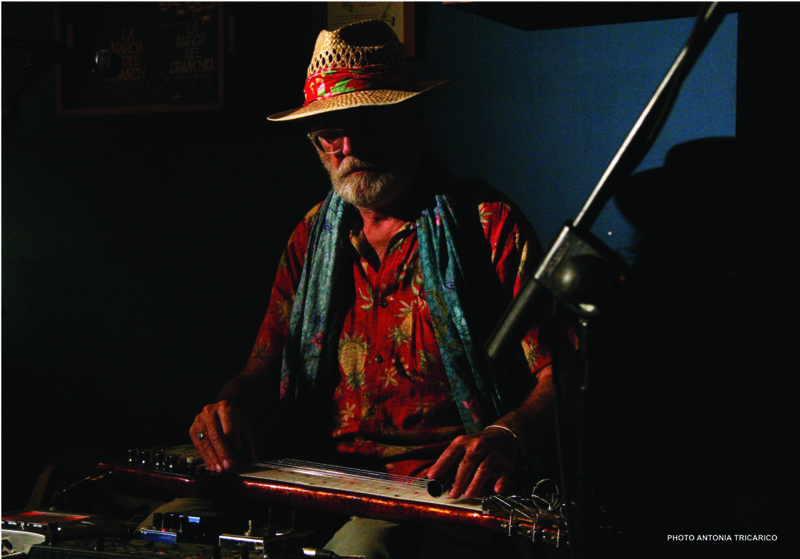 Tura New Music is thrilled to host international musical explorer, folk-blues and experimental music legend Mike Cooper in Perth for an artist residency in late April. Beginning his career as a folk-blues guitarist and singer songwriter, Cooper’s output has expanded to include improvised and electronic music, live music for silent films, radio art and sound installations. He is also a music journalist, a visual artist, film and video maker, avid collector of Hawaiian shirts and appears on more than 60 records to date. The residency will encompass a two-day conduction workshop at Subiaco Arts Centre with Perth based improvising groups and individuals culminating in a public showing at Subiaco Arts Centre on Sunday the 23rd of April at 5pm. Mike will also present composition and film workshops to students at WAAPA and Edith Cowan University. Perth audiences will have two opportunities to experience Cooper performing solo as part of his 75th Birthday tour. Tura’s monthly improvisation night, iMprov at bar 459 hosts Cooper performing an improvised solo set. Cooper’s favoured instrument is a vintage 1930’s National tri-cone resophonic guitar played acoustically and treated through a series of digital sampling and looping devices, his voice and a vast collection of found sounds. Support will be provided by participants of the weekend groups’ workshops. The residency concludes with the presentation of Cooper’s genre defining live original soundtrack to the 1928 black and white classic White Shadows In The South Seas at Pakenham Street Arts Space on April 26 as part of Hemispheres. Audiences can hear Cooper create vast sonic landscapes exploring his self-defined ambient electronic exotica style. “Running his Hawaiian loops sweet and slow, Mike Cooper’s homage to Arthur Lyman is a masterpiece of contemporary exotica.” – The Wire. Contact tristen@tura.com.au for more information. Contact josten@tura.com.au for more information. Tura and PSAS present Mike Cooper to perform his live score to the classic 1928 silent film ‘White Shadows In The South Seas’ at PS Art Space on April 27, as part of Hemispheres. The performance sees Cooper create a sonic landscape using his trademark vintage 1930’s National tri-cone resophonic guitar and electronics, and exploring his self-defined ‘Electronic, Ambient, Exotica’ style. The Academy Award winning White Shadows In The South Seas was the first Metro-Goldwyn-Mayer film to feature the well-known roar of Leo the Lion in the opening credits and the first MGM feature film to be released with pre recorded soundtrack. The film features a supporting cast of almost all Tahitian islanders and/or actors with only the featured stars and a few heavies/villains coming from Hollywood.